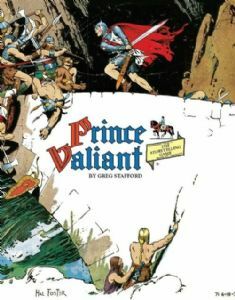 Outstanding for both beginners and experienced players, Prince Valiant® The Storytelling Game is a roleplaying game set in the Arthurian world of Hal Foster’s masterpiece comic strip. The game is by world-renowned game designer Greg Stafford (RuneQuest, King Arthur Pendragon). Like the majority of Greg’s games, the original edition of this game released in 1989 was published by Chaosium, Inc. The new Prince Valiant® The Storytelling Game is a significant improvement over the original B&W softcover. Notably, Hal Foster’s amazing artwork appears in color. The entire rulebook is full color! We’ve adding an insane number of Foster’s amazing illustrations. The text has also been updated. Though the game is already designed to be accessible to a wide variety of players, it nevertheless contains some portions that have been modernized.